კრებულში შესული კვლევები მომზადდა 2015 წელს, პროექტის „სისხლის სამართლის რეფორმების ხელშეწყობა საქართველოში სამოქალაქო საზოგადოების ჩართულობის მეშვეობით“ ფარგლებში, რომელიც დაფინანსდა ევროკავშირის და განხორციელდა „ციხის საერთაშორისო რეფორმის“ სამხრეთ კავკასიის რეგიონული ოფისის მიერ. ყველა კვლევა წარმოდგენილია ქართულ ენაზე და თითოეულს ერთვის მოკლე ანოტაცია ინგლისურ ენაზე. 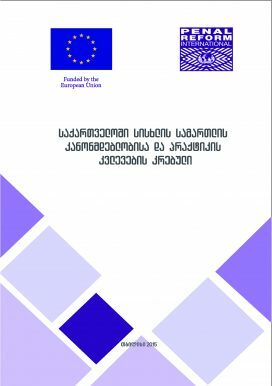 Research papers included in the collection were produced in 2015 under the project: ‘Promoting Criminal Justice Reforms in Georgia Through the Engagement of the Civil Society’ which was funded by the European Union and implemented by PRI. torture, or threat of torture as a circumstance excluding criminal responsibility; qualification of the action of an officer, when torture or threat of torture is used to obtain a confession. All of them are in Georgian with short introductions in English.